The all-new Honda Insight will arrive soon at Spinelli Honda in Montreal! Presented last January at the North American International Auto Show, the new 2019 Honda Insight will make its way later in 2018 at Spinelli Honda in Montreal, not far from Vaudreuil, Ile Perrot and Laval! The exact date and starting price are still unknown. However, we know that it promises the best fuel efficiency of its segment. Jean-Marc Leclerc, Senior Vice-President of Sales and Marketing at Honda Canada Inc., stated about the new 2019 Honda Insight that it was seen as the precursor of a new era of electrification for the new generation of Honda products, and will provide clients with the advantages of advanced technology without the usual concessions to design, luxury characteristics or accessory packages. The Honda Insight should compete with the best hybrids in terms of fuel consumption, in addition to providing the largest interior space of its category, as well as having attractive interior and exterior looks with a universal style. With its long roofline, its dynamic lines, its broad and low stance, its LED headlights and taillights as well as its front fascia with flared fenders, the new 2019 Insight has a killer look. In addition, thanks to its wide wheelbase, it offers the largest interior of its category, and since its batteries are located under the back seat, the result is a more voluminous cargo space. Under the hood, we find the 3rd generation of hybrid system with 2 engines from Honda, namely the 1.5L Atkinson cycle engine coupled with an electric motor. It also offers several high-end features such as optional perforated leather seating, a sound system with 8-inch touchscreen and a 7-inch LCD instrument cluster display. 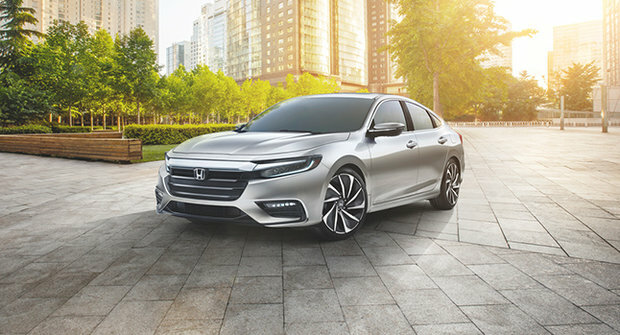 As for safety, the 2019 Honda Insight will come standard with the Honda LaneWatch and Honda Sensing assistance systems, which include, among others, the Collision Mitigation Braking System, Lane Departure Warning, Road Departure Mitigation, Adaptive Cruise Control and the new Traffic Sign Recognition function. If you want to learn more about the 2019 Insight, come see us at Spinelli Honda, not far from downtown Montreal, a few minutes from Vaudreuil, Laval and Ile Perrot.